There are several steps to getting the perfect, professional finish to your wall tiling project – preparing the surface, marking out the layout, using the right adhesive, using tile spacers and regularly checking your horizontal and vertical lines are level as you work. But even if you do all of these things properly you could ruin the end result if the cut tiles are done badly. Tiling with whole tiles is relatively easy – it is easy for a room to look almost finished quite quickly but it is the accuracy of the finishing where the ceiling and floor join the walls, and around doorways, windows, units and sanitary ware that will reveal how professional your tiling really looks. So if you aspire to be a really competent DIY tiler you need to get your cuts right. Whilst many cut edges may be hidden under sinks or units etc. the majority of them will be on show at the corners of walls and the junctions of walls with the floor and ceiling. Particularly in places like bathrooms many awkward cuts will be needed to finish tiling around sinks, toilets and other sanitary ware. Selecting the right tools is the important first step, but, of course, the tools you use to cut the tiles will be dependent on which type of tiling you are installing. More and more wall tiles are now porcelain rather than ceramic so the relatively simple method of scoring a ceramic tile and breaking it along the score line cannot be used with porcelain tiles because they are too hard. Natural stone tiles are becoming more affordable and more and more people are choosing them for their bathrooms and kitchens but these again are too hard to score and break. So you are almost sure to need an electric tile cutter but the question is – what type? There are angle grinders and wet cutters and diamond cutters so for the non-professional the decision on which type of cutter to buy or hire is vital if you don’t want to spend excessive amounts of time cutting and if you don’t want to ruin too many of your brand new tiles. It may be a case of trial and error depending on the specific type of wall tiles you have so it is often best to hire a cutter rather than buying one so that you can try it out. If you can, try and get some advice from a professional tiler, tile shop or hire shop on the most suitable cutter for your tiles. Now start by measuring the space for each individual tile section just above the floor or below the ceiling and in the corners of the room. These are the simplest sections to start with but don’t assume the space is the same between the last full row or column of tiles and the edge because rooms are very rarely “square”. Measure and mark each tile on the back with the cutting line using a pencil – don’t use a felt tip pen as this might discolour the grout once it’s applied. Continue to measure, mark and cut all the tiles that are an approximate square or rectangular shape remembering that some of the shapes might be “skewed” if the walls, floor or ceiling are crooked. 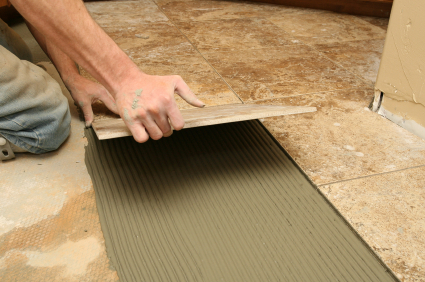 Don’t forget to check that any pattern on the tile is the right way up before marking the cutting line. Many people choose to use angle grinders for certain types of natural stone although it very much depends on how hard the tiles actually are (some limestone, for example, is quite soft but other types extremely hard). A better option is often a good electric tile cutter but even with a good quality machine the final edge as you come to the end of the cut can often be damaged. If this happens then try cutting part-way from one edge of the tile and then starting from the other end and finishing near the middle. Once all these straightforward cuts are made and the tiles fixed in place, the room will definitely be looking more finished with only the final odd-shaped tile sections left to cut and install. These irregular shapes are often the most difficult to cut but they do not have to be perfectly accurate as the grout can be used to fill irregular gaps. Use a manual tool such as a tile saw or tile nibbler to cut the required shape – always working with the glazed or top surface of the tile uppermost and cutting downwards only. This will prevent any serious damage to the visible surface. Where you need to cut a curved edge on the tile, start by marking a straight line and cutting off as much of the unwanted tile with a straight cut before using the tile saw and then nibbler to get a neat curved edge. Remember that the type of tile that you are cutting will affect your choice of tools and your ability to create a professional finish. 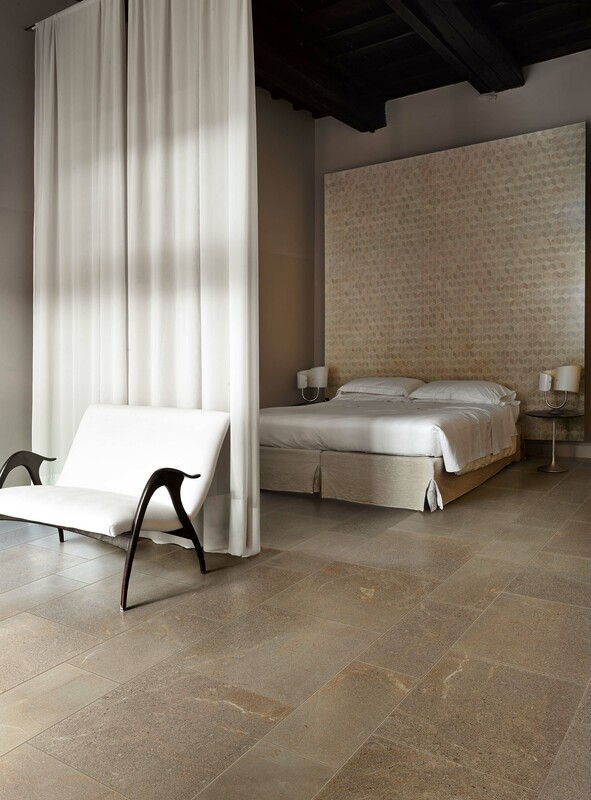 Ceramic tiles are the easiest to cut with minimal damage and you can generally use manual tools; porcelain tiles are very hard and will require an electric cutter and so too will most natural stone tiles.